The FireBox 8 Kiln is the ideal small kiln for glass fusing, precious metal clay, ceramics, enameling, knife making, and a variety of other applications. 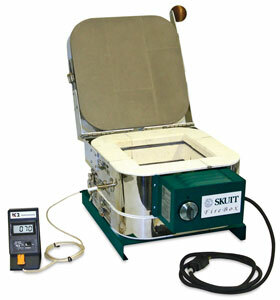 With a maximum temperature of 2000°F, it reaches glass fusing temperatures in less than 20 minutes. It plugs into any standard 20-amp household outlet. The kiln is buckled to its base so it can’t slip off. Users can load the kiln through the top, or unbuckle the body from the floor, assemble the work, and place the kiln back over the shelf and onto the slab. A wooden handle positioned on the back of the kiln stays cool, making this compact kiln extremely easy to carry from place to place. Using the wooden handle, the hinged lid can be opened over 90° with one ungloved hand. Because the lid is hinged, it stays out of the way when the kiln is being loaded, and eliminates the worry about where to put the hot lid when working inside the kiln. The easy-to-read digital pyrometer allows the user to know exactly what temperature the kiln is, and whether the temperature is going up or down, making holding at specific temperatures much easier. The 9 volt battery for the pyrometer is included. FireBox 8 Accessory Kit — Includes one 7 inch square × ½ inch thick kiln shelf, three 1 inch supporting posts, a sample sheet of fiber paper, and 1 lb of kiln wash.
GMLT FireBox8 — This kiln offers all the convenience features of the FireBox 8 plus the GlassMaster LT3 Button Controller, which allows users to write and store up to five programs with up to eight segments each. It also includes the exclusive Skutt Glass Fire Mode — simply choose Fuse, Tack Fuse, or Slump, pick a speed based on the size and thickness of the project, and press "start." Features of the GMLT FireBox 8 include an 8" × 8" × 4½" chamber, a "cool-to-the-touch" wood handle, and a stand. 120V. Includes a two-year manufacturer's warranty on parts and labor.